The UK is due to depart the EU on 29 March 2019, following the landmark referendum in June 2016. Brexit has heavily influenced the property investment market in the UK. The backlash of the event has generated low-interest rates across the UK, deterring investors to focus on the London market and to look for new areas across the UK to build and invest. It has been predicted that we face slow growth back to better interest rates over the next 5 years. From a tax perspective, there have been multiple changes to taxation attempting to limit investment and prevent rising prices. But investment is still being fuelled by low interest rates, together with a weak British Pound. 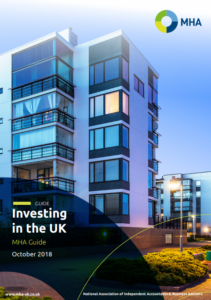 Our MHA Investing in the UK guide touches on some key areas that need to be considered when embarking on a project to own property in the UK. Whilst the UK consists of England, Scotland, Wales and Northern Ireland, each territory (particularly Scotland) has devolved powers regarding legal charges over land and taxation powers. This guide has been prepared for investment in England but will highlight areas where some rules may differ.